Experience cooking like a Chef with this Double Pan! A combination of 2 pans used to cook your food. 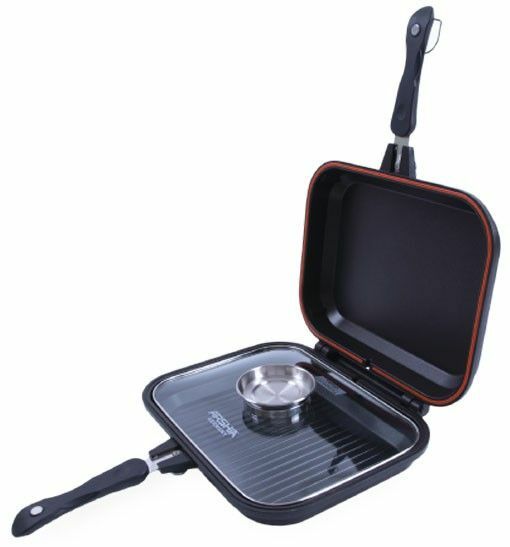 This magic twin pan can be used in making various delicacies with ease. Sautee, grill, cook, fry your vegetables, fish, meat, poultry or combination of any food you desire to create that tasty flavor. Use both sides of the pan to allow for complete cooking. This Double Pan is lightweight, dent & scratch resistant, non-corrosive and an excellent thermal conductor of heat making it the ideal material for cooking food. Aluminium die-cast is the best metals for conducting heat allowing for quick heating and retaining of heat.